At a very young age...huge influence where my grandmothers who encouraged my love for crafting. I would say that for the last five years I try to stamp on a daily basis; but I had my first collection of stamps at the age of 8 and used to, actually still do, make cards and paper treats for friends and family. I think it depends on my mood and the set I'm using. Ribbon is for sure a must embellishment for me so you'll pretty much always see that on my cards and projects. Altered items. I love to turn ordinary things into something completely different...it's like that old saying, "One person's trash is someone else's treasure!" Ohhh, hard one...it used to be the little witch from the Trick or Sweet set but since my creative energy is geared towards Christmas right now I would have to say the snowman cupcake from the Home Sweet Home set. Oh but a cupcake of course and a little java to go with it is just the perfect treat! Thank you Carolina for being Our Friday Friend!!! yea! I'm so happy my friend IRL is our SASI Friday Friend! 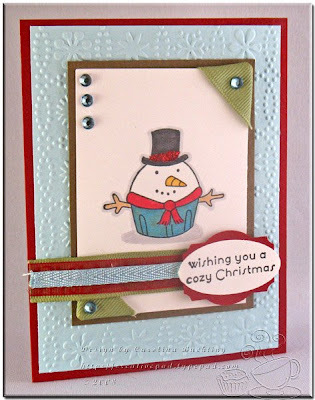 woohoo - love this snowman card!! Great card, Carolina - love the ribbon on the corners...cute! Congrats Carolina! What a wonderful card! So Cute!